In practice since 2001, Dr. Tim Wood opened Mission Family Chiropractic in 2006 to benefit the families in our community. A genuinely caring person, he named our practice to reflect that he’s on a mission to help people. Additionally, this philosophy aligns with our philanthropic focus on supporting missions to improve the lives of individuals around the globe. Our practice is also located in the Mission area of Kelowna, so it’s very aptly named! 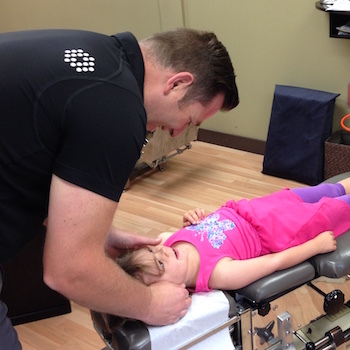 To reach people of all ages through natural chiropractic care, allowing them to live their lives to the fullest. Or Simply: Optimal Spine, Optimal Health, FULLY ALIVE! Our goal is to help you have an optimally aligned spine so that you have the greatest possible health. Many people seek our help to improve their overall health while others might have a particular challenge such as headaches or pain and injury. On top of seeing thousands of clients who can function pain-free, participate in sports and enjoy life, we see amazing miracles happen for people with common ailments and conditions. One such success story was a 3-year-old girl Dr. Wood saw when he was in the community offering posture checks on Canada Day. She was stricken with a condition called atonia, where her muscle tone and strength weren’t properly developed. She was told she would be in a wheelchair most of her life, and would have particular difficulties climbing stairs, a hill or anything else that involved more energy. The girl had been in physiotherapy from a few months after she was born until Dr. Wood met her. After receiving chiropractic care, she got her life back. Dr. Wood recently saw her running around and playing games, like any other child her age. It’s just one example of many that shows how lives can be transformed at Mission Family Chiropractic! On-site X-rays can be taken when necessary to get a more complete picture of your spine and health. Contact us today to book your time, and improve your life!